"This icing is ideal for anise cookies. Separate it into several little bowls for lots of colors. Tint with a few drops food coloring. Use little paintbrushes to color. Kids will love it!" Blend sugar, salt and flavoring. Add cream or water to make it easy to spread. Makes enough icing for 3 to 5 dozen cookies. 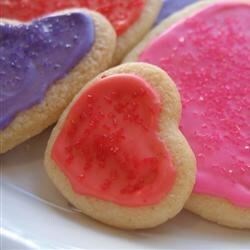 This is the recipe I've used for almost 30 years on Mary's Sugar Cookies. It was really awesome but it is really thick but delicious. But don't add too much salt maybe just a pinch.